"3rd album from Causa Sui drummer Jakob Skøtt expands his one-man-band experiments into vast new territories. Taurus Rising is built from motoric synthesizer arpeggios and heavy duty live drumming. But rather than simply worshipping endless repetition, Skøtt reaches an impressive array of expressions on each of these five mini epics - each song is ALIVE - frequently whirling off track like the wind direction in a sand storm, leading to some mind-altering melodies and rhythms that’ll keep you on your toes. Washed currents of pulsating analogue synthesizer scores, pre-fusion jazz-sensibility and fuzz’ed out electronics all tied together by fevered rhythms. Jakob Skøtt is the drummer in revered danish experimental psych act Causa Sui and has previously collaborated with artists from Tortoise and Sunburned Hand of the Man. In a number of different outfits he has also released thru esteemed labels such as Morr Music, Ghostly International, Darla Records. Furthermore Jakob has done exclusive live visuals and artworks for Amon Düül II, Earthless, Manual, cult actress Asia Argento as well as The Roadburn Festival. 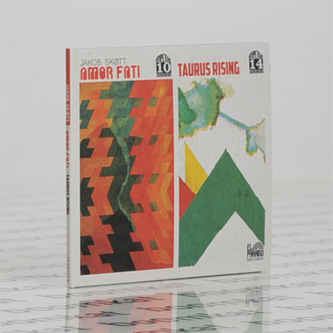 Taurus Rising is released as a single LP as well as a 2xCD package also containing his previous album Amor Fati. All drums for each albums were improvised in a single afternoon. Praise for Amor Fati: ... It feels like a natural integration of styles across the ages, an effortlessly beautiful and liberating classically psychedelic music. / Musique Machine The fully instrumental Amor Fati still has lots of synths and sequencers, but it also features bombastic, groovy and funky drums and is much more energetic and powerful. It’s a sort of combination of early 70s cosmic music and modern day technology and I love it! / Psychotropiczone ... Amor Fati sounds like Boards of Canada after a long night of agitation and angst."